I’m totally enjoying my new Gamer oversized bean bag chair from Sumo Lounge. I really am, and so is my dog… who thinks I’m the best mommy ever for providing her with what she views as her very own gigantic dog bed. Seriously, I’ve barely gotten out of it since I got it! I’m not a gamer, but I am a work-from-home always-on-my-laptop girl. I also live in a small city in Pennsylvania in a one bedroom apartment — so space is definitely an issue and why I was interested in adding a bean bag chair to my home decor for additional seating. But enough about me, let’s talk about the chair. 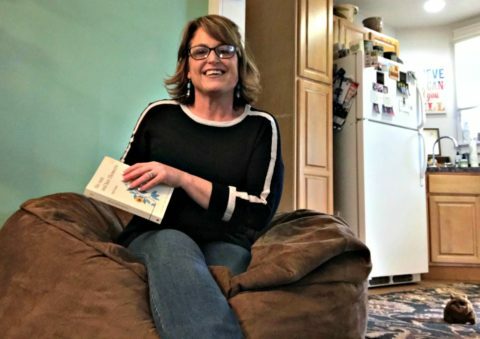 My first impressions of this Sumo bean bag chair. Honest pros and cons about the Gamer giant bean bag chair. Who will (and who won’t) love this chair — if you’re thinking of giving it as a gift. It is big. Like… really big! When the folks at Sumo Lounge asked if I’d be interested in trying out their Gamer oversized bean bag chair, I had no idea it would be so large. It’s 48″ x 48″ x 30″ and weighs 50 lbs. This chair is substantial! My recommendation is to have a friend help you unpack the Sumo bean bag chair and help you to maneuver it — because it was hard for me to unpack it and roll it around by myself. The high-quality microsuede cover that slips over it is durable, looks nice, and is washable. The polyurethane foam is very comfortable and offers more support than old school bean bag chairs — plus this one will never go flat. I was able to use the chair within minutes of unpacking it — so no “real” assembly required. The difficulty I experienced maneuvering it out of the packaging. The remote control holder appears cheaply made, doesn’t match the cover, and has “SUMO” on it. That ruins the upscale look of this bean bag chair, so I don’t use it. The confusing nature of the assembly instructions that were in the box versus the assembly instructions that were written on the packing slip. Who Will Like This Giant Bean Bag Chair The Most? Even though I’m personally in love with it, it’s not the perfect chair for everyone. For example, I wouldn’t buy an oversized bean bag chair like this for an aging family member or friend who has difficulty getting in and out of chairs — because this one takes some effort to “climb” out of! Kids (and adults) who love gaming — because it’s super comfy for long periods of time. Anyone who needs additional seating — because it can be moved around easily (unlike a large piece of furniture) and stored elsewhere if need be. Anyone who needs additional table or serving space (especially in a small apartment, like mine) — because the top remains mostly flat whenever someone’s not sitting in it. College kids living in dorms or in fraternity/sorority housing — because “lounging” is pretty much a way of life when you’re in college — whether you’re studying, watching TV, chatting with friends, or partying. Anyone with a theater room — because it’s a comfy way to watch movies. Anyone who loves binge-watching TV shows — for the same reason as above. Anyone who works from home (like me) — because it provides flexible workspace options. Anyone with a casual, informal office space — because it’s a “fun” type of seating that works well in a laid back work setting. 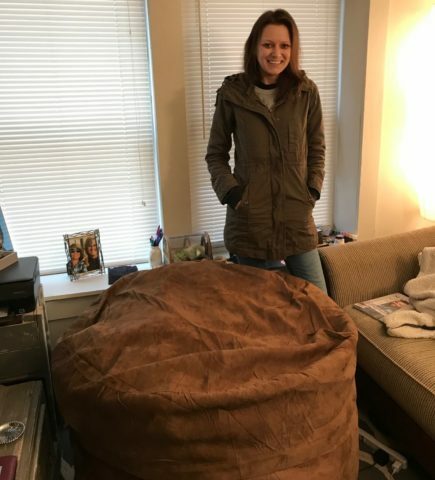 Besides the time it took to actually unpack it, I’ve come to love this giant bean bag chair. Now I sit in it for hours at a time (… when I’m able to persuade my dog to share it). You can see that even though my apartment is pretty small (less than 800 square feet), I’ve found a nice place for it. It fits right in and looks great! It has added a new seating option for me (since a traditional loveseat won’t fit). It’s easy to keep clean (since I can remove and clean the outer microsuede cover, as needed). It’s really comfortable — more so than any other bean bag chair I’ve ever sat in. I can easily reshape it whenever I want to. 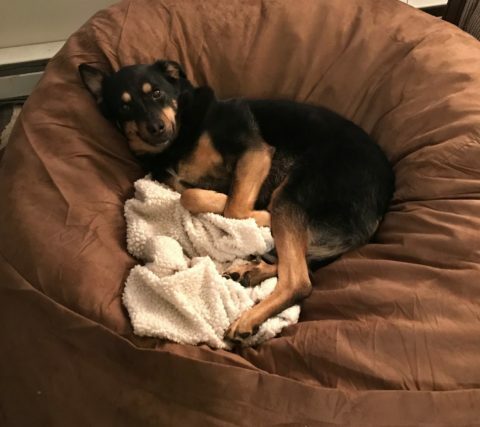 The bottom line is this huge bean bag chair is super comfortable, easy to keep clean, durable, and well-made. My Sumo Lounge chair is a tan brown color, but it comes in about a dozen other colors — to work with just about any color scheme.